According to Norse, Scandinavian and Germanic mythology, Odin created man and put him on earth teaching him to hunt, fish and till the soil. He also taught man to fight. He was fond of a good fight himself and oftentimes joined in battle. He created Valhalla where the gloriously slain could spend their time feasting and fighting. Odin was also known as Wotan or Woden and was considered as the highest and holiest. All other Gods were supposed to be descended from him. His wife and queen was Frigga, and their throne was in Asgard, a city in the clouds. Odin had great power. He obtained this great power from Memir, an old giant who guarded the sacred “ fountain of all wit and wisdom” in whose depths the future was shown. The giant was reluctant to allow Odin to drink from the fountain, and only after Odin had plucked out an eye and thrown it into the water as a pledge, was he allowed to drink. His remaining eye symbolized the sun, and the eye in the fountain the moon. Odin had many titles, known as the God of wind, Father of the Gods, Lord of Men, Shifty Eyed and many more. Another power Odin had, was that needed no food. Occasionally he would sip on sacred mead. He had two hounds, Geri and Freki, and he would feed them with meat set before him. He also had to ravens, called Munin (memory) and Hugin (thought). Each morning he sent these ravens out to collect news. 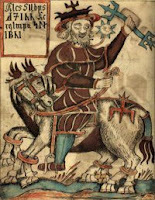 He was also known as the Wind God, and, mounted on Sleipnir and accompanied by his wolf-hounds he would charge through the sky heading the “Wild Hunt” of the souls of the dead. It appears as though Wednesday is named after Odin, (Wodan), or Woden’s Day, Wednesday. This posting does not do real justice to the occasion. Much more is available from many sites. My main source was “The Book of Knowledge”, and the image from Wikipedia. This is amazing I like so much mythology, I remember I watched a movie called Beawolf and it was perfect because I took my generic viagra and then I felt strong like one of those mythology characters.